Ancient Greek Agriculture was the foundation of the Ancient Greek economic. Nearly 80% of the population was involved in this activity. The ancient Greeks were, for the most part, a rural, not an urban society. The beginning of agricultural operations was often signaled by some particular astronomical event, the seasonal behavior of animals or drastic change of season. It always rained too much in the winter and not enough in the summer. Since most of the soil was rocky and lacked nutrients, many crops wouldn’t grow. 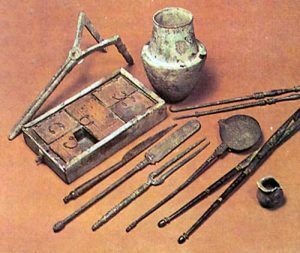 Farming (Ancient Greek Agriculture) in ancient Greece was difficult due to the limited amount of good soil and cropland. 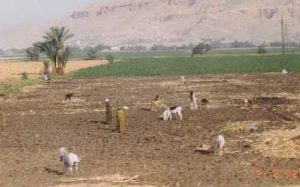 It is estimated that only twenty percent of the land was usable for growing crops. The main crops were barley, grapes, and olives. These core crops were augmented by vegetable gardens (cabbage, onion, garlic, lentils, chickpea, beans) and orchards (fig, almond, and pomegranate). Herbs were also grown (sage, mint, thyme, savory, oregano, etc. ), as were oilseed plants such as linseed, sesame, and poppy. Autumn was the most important season. In the beginning of autumn, farmers collected deadfall and prepared supplies of firewood; as winters in the highlands could be harsh. Scholars have assumed that the Ancient Greek Agriculture infrastructure of ancient society was often ruined by the attack, as, for example, Athens was relegated to poverty in the aftermath of the Persian and later Peloponnesian invasions. In the plains, where the soil was richer, they also grew wheat to make bread. The Greeks did use artificial means of irrigation. They dug tunnels to channel water from springs to farms. Archimedes, a prolific inventor, and mathematician developed a spiral structure in a cylindrical casing that could lift water when it was spun. It was used to raise water from a stream or irrigation ditch to the fields. In summer, irrigation was indispensable. In June, the farmers harvested with sickles; the scythe was not used. Wheat was threshed by being trampled upon by oxen, donkeys or mules. The grain was then stored. It was left to women and slaves to grind it and make bread. Most farms were small with four or five acres of land. Farmers grew enough food to support their families and, at times, they grew a small surplus to sell at the local market. Some families rented a small piece of somebody else’s farm and then paid the owner part of the crop as rent. 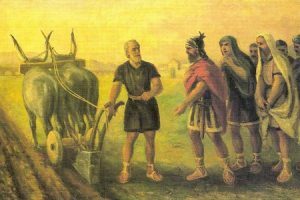 All of the farmers in ancient Greece lived in the country. Their jobs were difficult because many people depended on them for food and the weather was often not the best for growing crops.